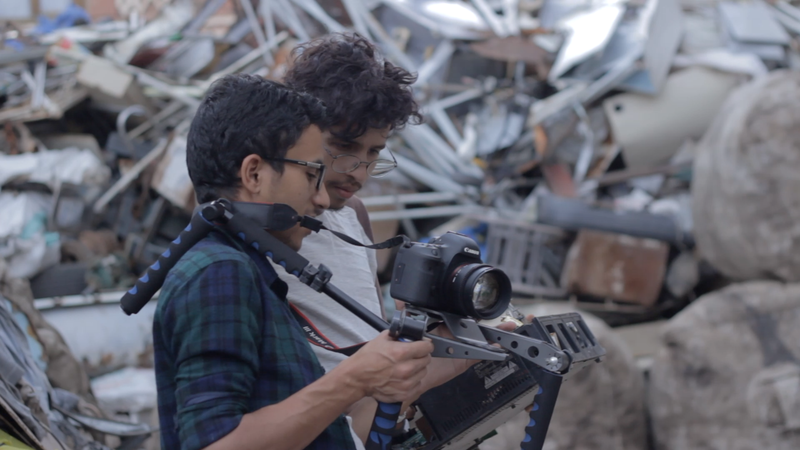 Osama Khaled is a young filmmaker currently based between Sana’a, Yemen and Berlin, Germany. 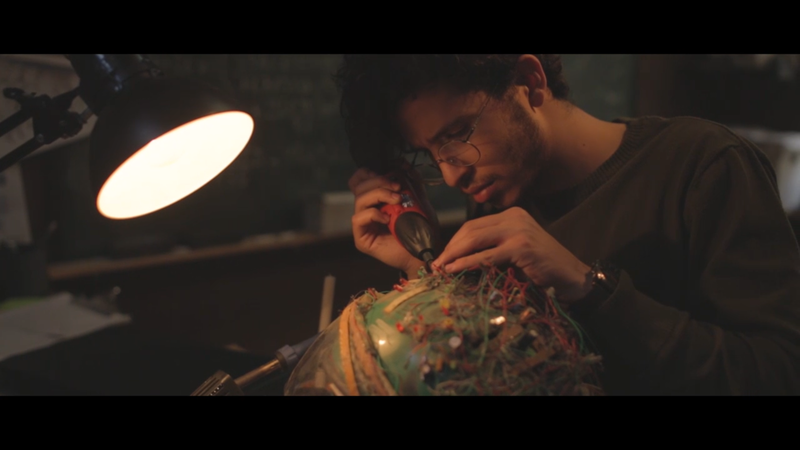 Khaled’s most recent work, The Helmet, is a science-fiction short set in war-torn Sana’a and is currently in post-production. His earlier short Not Acting Anymore, which traces the lives of two young boys living through the conflict in Sana’a, was screened at the Arab Film Festival 2017 in Los Angeles, USA. Since the war broke out in 2015, Khaled has documented the voices of its victims through short documentary films and campaign videos. These include Weddings into Funerals and Waiting for Justice for the Yemen-based NGO Mwatana, and Yemens’s Forgotten Children for Save the Children. Ruya spoke to Khaled about his work as part of its Regional Conversations series covering art and conflict in the Middle East. Still from The Helmet, 2018. Courtesy of the Artist. The Helmet is science fiction, yet it is set in the real context of the ongoing war in Yemen. As a story-teller, how do you negotiate between documentary and fiction? It depends on the story. When I have a story in mind, I will find the best way to deliver it. In documentary and fictions films alike, I find myself feeling with the characters. I recently finished a film about kidnappings in Yemen for the NGO Mwatana. At first I was unsure about taking on the project because it is so dangerous to make such films in Yemen today. We interviewed the victims’ families, but often used a fictional style to deliver the message. How did you develop the story for The Helmet? When the war started in 2015, I tried hard to forget about it. The airport in Sana’a had shut down, there was no water, no electricity, and I lived in a dark room for a month. Everyone around me was depressed. I imagined myself being elsewhere. I was drawn to new virtual reality technologies, and how they could make you feel like you were in a different place. The story grew from there: the hero, stuck in his bedroom in Sana’a, builds a helmet in an attempt to escape the reality around him. Shooting The Helmet. Courtesy of the artist. In his book The Iraqi Christ (2014), Hassan Blasim comments on the absence of genre fiction in contemporary Arabic literature. Could this also apply to science fiction films? I’ve not watched any Arabic science- fiction films. I don’t think there are any. As filmmakers in the Arab world, we often focus on drama and real-life scenarios. We are always told to stop dreaming, to stop imagining and to be grounded in reality, especially in Yemen. Our institutions also limit us. When I was at school, daydreaming and imagining were considered silly and stupid. I am currently finishing my degree in media studies at Sana’a university. The building is old and uninspiring. They don’t have any new equipment or books, it’s like going back to the 1990s. I learnt to make films from watching youtube tutorials, especially those of Philip Bloom, and meeting filmmakers online and in Sana’a. What were the challenges of making The Helmet? The 7 minute short took three years to film and produce because of the ongoing war in Sana’a. It’s very difficult to film outdoors in Sana’a today, so we shot most of it indoors, in my bedroom. I was able to film one street scene. I put together a crew of 28 young people. Many of them had no experience in film, yet they all connected to the story. “Yes, I feel this way too. I am going through the same thing,” they would say when I told them the plot. 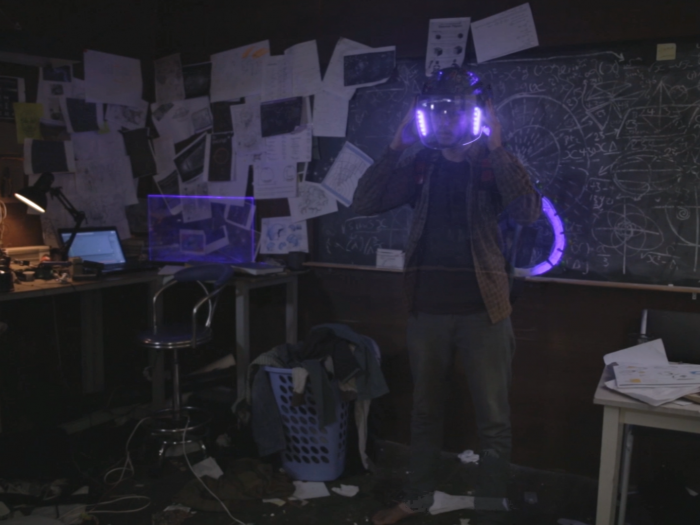 My friend Ahmed Doweid, an architecture student, designed the helmet and built the sets and the props. Set As we made the film, I noticed how the crew shared the same dream and the same hope with me. How would you describe the conditions for artists working in Sana’a today? It’s very difficult to make films in Sana’a today. The authorities want to censor us. They also want to rewrite our history. They say that we should focus on fighting a common enemy, despite all the problems and political differences within Yemen itself. This is wrong. Artists, painters, photographers should be given the freedom to document the war, because they can give more reality and feeling to the story. Your short film Not Acting Any More is based on found footage shot by your two younger brothers. How did you develop this idea? At the time, I was part of a filmmaking workshop in Sana’a called Comra, and I spent a long time out of the house, looking for a story that I could film. I couldn’t find anything. I discovered footage that my brothers had filmed with their small handy camera. I used it to give an account of the war from the perspective of two boys. Though I’ve presented a version of the film at festivals, it is still in production. I’ll be following my brother’s stories until 2020, a total of five years. I want to show the lives of two children who have grown up in a warzone, and how it changes them. What do you hope The Helmet will achieve? I’m submitting The Helmet to festivals and the next step is to get funding for a future film, which would include training for Yemen-based filmmakers and artists. As for my audience, I’m reaching out far beyond the Arab-world. The Helmet is not just a story about Yemen. It’s about the youth in Syria, Iraq, Egypt and other countries at war. There are a lot of young people stuck in those places who are trying to do something and overcome their daily struggles. This is a short film is about them.